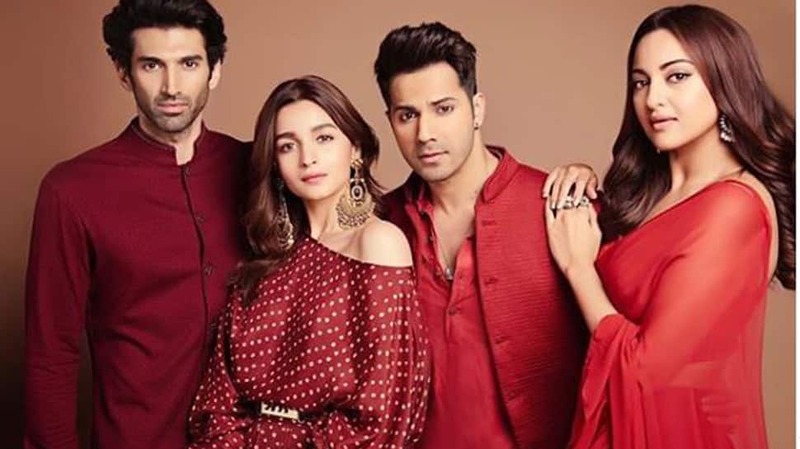 New Delhi: The cast of Kalank which includes Alia Bhatt, Varun Dhawan, Sonakshi and Aditya Roy Kapur is on a promotional spree. The movie is backed by Karan Johar's Dharma Productions and is slated to hit the screens on April 17, 2019. Directed by Abhishek Verman, Kalank unites Bollywood's two most revered couples on screen, Varun Dhawan, Alia Bhatt and Madhuri Dixit and Sanjay Dutt. The Dhak Dhak girl and Sanju baba will share the screen space after twenty years whereas Varun and Alia were last seen in Badrinath Ki Dulhaniya. 'Kalank' trailer was launched a few days ago and has received a warm reception from the viewers. It looks promising and high on drama, emotions. As per reports, the film was originally conceptualised with a different star cast of Shah Rukh Khan, Kajol, Rani Mukerji and Ajay Devgn. Also, Karan Johar himself was supposed to direct it and his father late Yash Johar was to produce it. However, after Yash's demise, KJo dropped the idea and after all these years, the movie bounced back to life with a fresh star cast. These pictures of Alia Bhatt, Varun Dhawan, Sonakshi Sinha and Aditya Roy Kapur call for a freeze frame!